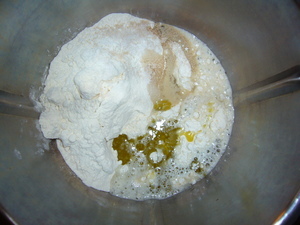 Place all the ingredients into the TM. 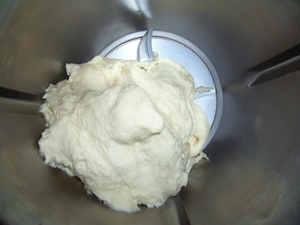 Process on speed 5 for 3 seconds, then speed knead for 3 minutes. 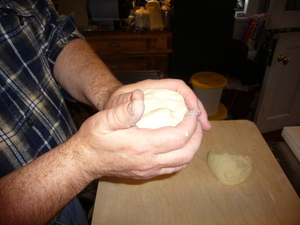 NOTE: If you don't have a TM, you can use your dough hook for about 10 minutes or knead by hand. 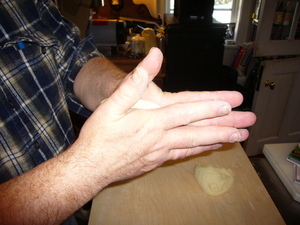 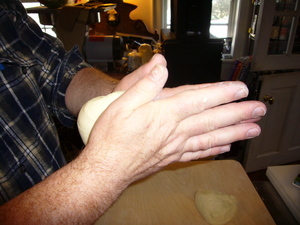 Then pinch the dough with your palms, as a ball starts to form between your wrists. 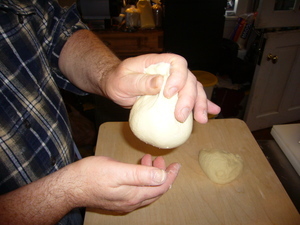 Rotate the dough 1/4 turn, and repeat. 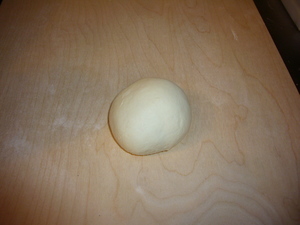 As the ball starts to form, you should be pinching less dough with each turn. 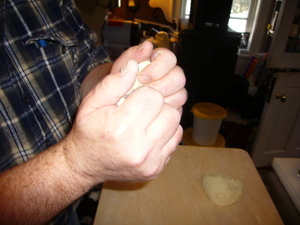 Eventually, you have a small ball protruding with all the seams collected between your fingers. 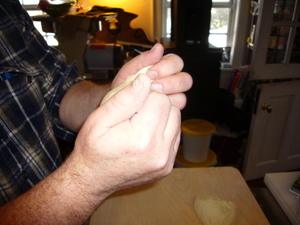 Pinch the seams together and twist, closing the seams. 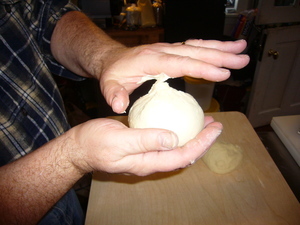 Place the dough ball in an oiled dough tin... You basically want to have a little puddle of oil on the bottom of the tin. 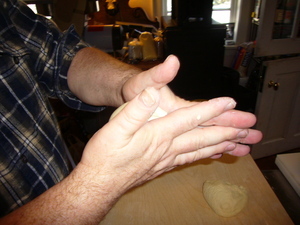 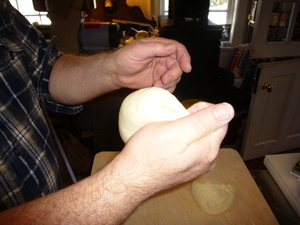 Press on the dough ball with the pads of your fingers, firmly, to flatten the ball, but not so firm as to squish through the dough. 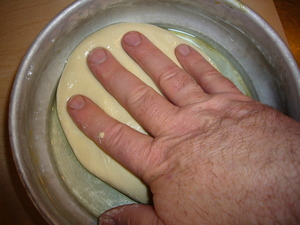 While slightly spreading your fingers, twist your wrist 1/4 turn to turn the dough in the oil. 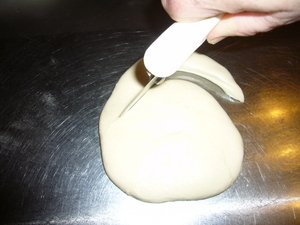 Repeat multiple times till the dough seems to no longer flatten. 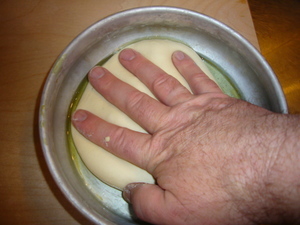 Turn the dough over and repeat. 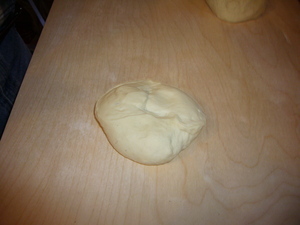 Repeat the turns and pressing until it once again seems to have flattened as much as it is going to. 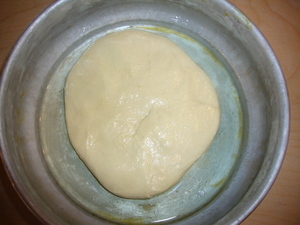 Cover the tin with it's lid or another tin, and allow to rest for an hour. 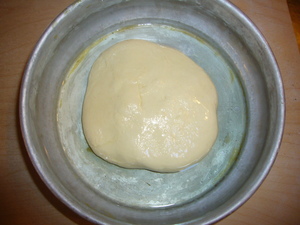 If using this dough for pizza or something else later, place in the refrigerator for up to 2 days. 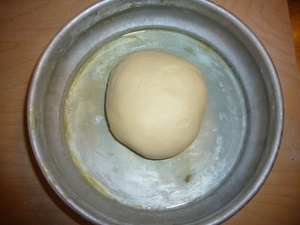 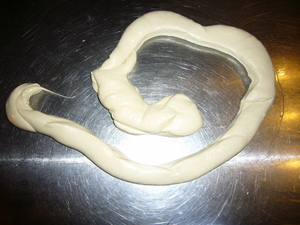 Place the dough on a stone or steel table (wood isn't good due to the oil), and start cutting a strip around the dough. 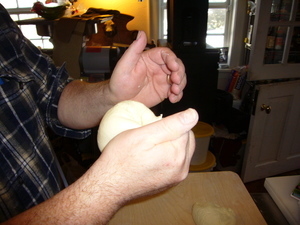 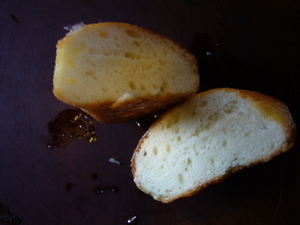 Continue cutting until the entire dough is cut into a rope. 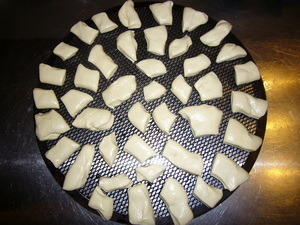 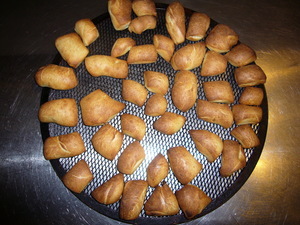 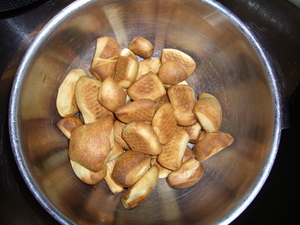 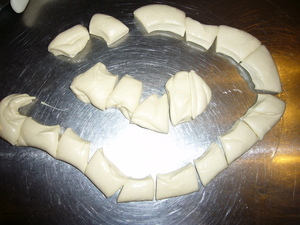 Cut the dough into many pieces, about 3 - 5 cm. 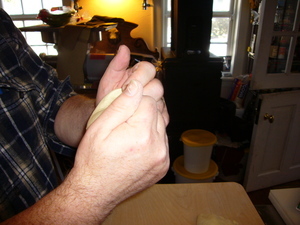 Place the pieces on a pizza screen far enough apart from each other that they will not join when baked. 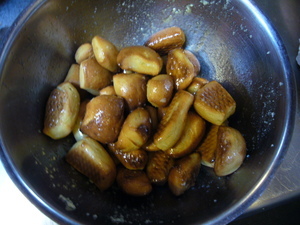 Bake in a 500 degree oven for about 6 minutes or till golden brown. 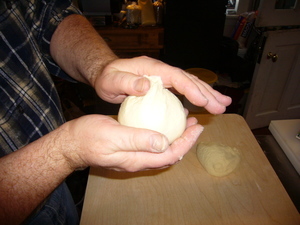 While the knots bake, throw the garlic into the TM while running at speed 6. 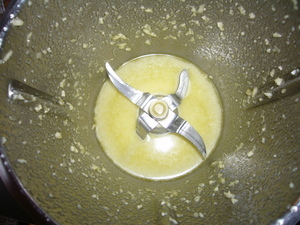 Add the oil and allow to process for about 10 seconds. 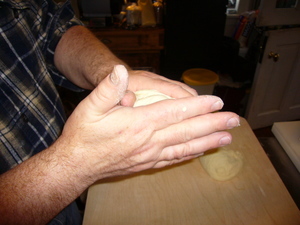 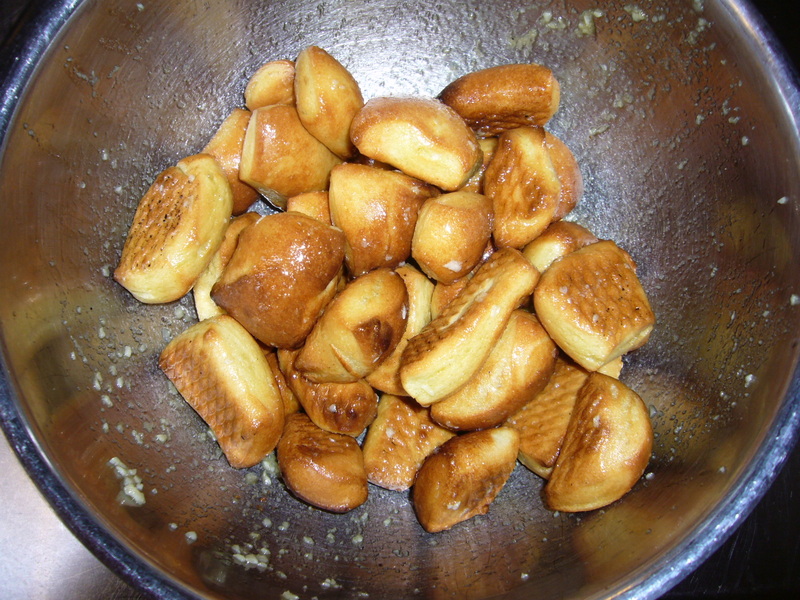 Place the knots into a bowl.